'Five years ago I stood on this stage and I said goodbye. Five years later and I'm standing on this stage and I say hello' - Lead singer Michael Sadler, no doubt pleased to be back and sporting the bald eagle style which at first confuses half of the audience to believe their at the REM reunion? 'Spin It Again' - The DVD, title obviously taken from the song off the 20/20 album celebrates Saga as they are, together again on stage. Well... they were merely apart for five years... geez, lemon squeeze. The total running time of this DVD is approx 130 min including the bonus behind the scenes doc. Germany is home away from home to the Canadians and especially Munich hold a special place in their hearts. Starting up the concert with the new composition of "Anywhere You Wanna Go" and the instant follow up with one of the oldest (Mouse In a Maze) is a nice reminder to the fact that Saga always been true to their colours. Perhaps with the only difference that some of the eighties songs are basically Synth-pop meet Prog-Rock? In my humble opinion, the golden era sounded a lot like the fusion between synth and prog (no?). Darn catchy and poppy keys no doubt. The audience, way too laidback at first, but things are about to improve with the perfect sing a long of "Careful Where You Step" - classic Saga if ever. The instrumental, "Corkentellis", clearly not the favourite and basically the intermission and/or tea break. The darn catchy "The Flyer" is however and it always remind us of a rockier A-HA somehow? New drummer = new drum-solo? Not quite as "Fish Beat" is at first based upon the old and very classic solo with a twist. Sadler sounds really good throughout the gig and the break was probably a good thing as well as time for him to recharge the battery and give it another go. 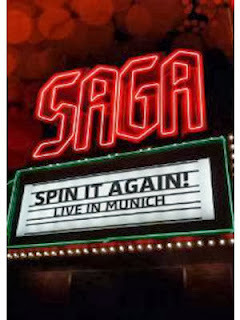 Saga end the show with their very best and the likes of "On The Loose", "Wind Him Up" and "Don't Be Late" almost brought a tear to the eye. The behind the scenes documentary takes us through the whole on tour she-bang including road crew as well as all the band members. Sadler and Gilmour speak about energy and the joy of performing together on stage. It's the standard chat 'Each time they walk on stage, its fresh and new', but they seem to have fun, cracking jokes and having a laugh or five. For instance, the first two things to figure out at hotel rooms in Europe. 1) The TV remote control. 2) The plumbing? There's something dodgy about the foot bath? Apparently the band found new drummer Mike Thorne under a rock? (according to the DVD and Mike - not my opinion) I don't know. They make however sure to give each other space and believe themselves to be more responsible nowadays since they are family men. To the tech nerd, there's your sound and monitor engineer where the latter goes on and on and on about working the soundboard and how not to cause feedback. That's strickly sound related stuff and not your must leave positive/negative b.s. opinion online or whatever. The guitar tech gives us important information about the fact that Ian 'Statue' Crichton use merely two guitars on stage. One tuned to 'D and the other to 'E and he can't break a string, if he breaks a string, the song is done. Poor guitar tech has to make sure to change strings everyday or end up in the naughty corner. The band merely wish he could provide the same strict routine regarding his underwear (he shoots, he scores!). Final verdict: Addictive music and professional musicians with the nice DVD production and excellent photo. Highly Recommended.